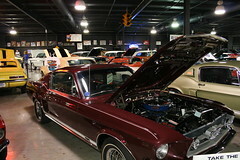 If you are into Mustangs, especially the 1967 vintage as we are, you have to check out our newest Feature Car. We spotted this beauty while touring the Floyd Garrett Muscle Car Museum. It is a 1967 GT with a 4-speed and restored to concours quality. We have also posted a video of the car which you can view below as well as on our feature car page. You will want to see the excellent detail in this car. Click Here to visit this car.